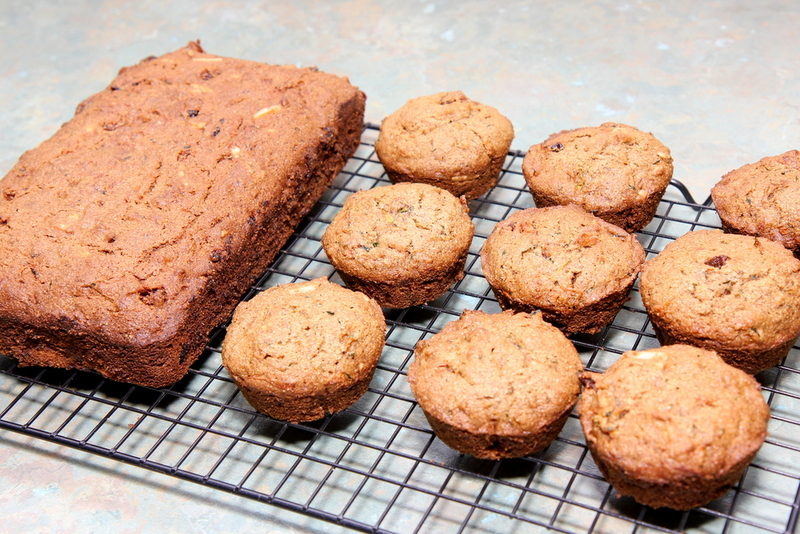 Zucchini is one of my favourite veggies, not because I think it tastes particularly fabulous on its own but I love its ability to absorb all of the flavours surrounding it and how it gives such lovely moisture when used in baking. It is also low in calories but high in folate, potassium and vitamin A, amongst others. In a large bowl, mix together all of the dry ingredients with a whisk (or speed 4 for 8secs). Then fold in the nuts and cranberries. The nuts and cranberries are optional, but use them if you can because the berries give a lovely tang and the nuts add a nice texture and a bit of crunch. If you’d prefer not to use the dried fruit, the chopped chocolate sprinkled on top, makes a great addition. Cook in a preheated oven at 170 degrees C for about 40 mins (remove the muffins after about 25 mins), or until a skewer inserted into the middle comes out clean. Cool in the pan for at least 10 minutes then turn out onto wire racks and allow to cool thoroughly. Delicious just served as is or sliced with some nuttlelex. I froze the leftovers (mainly so I wouldn’t keep eating it!) in individual serves with nuttelex already spread on it so that it is easy to throw in lunch-boxes.